Although most people think about older adults or young children falling, falls can happen to anyone at any time and most falls can be prevented. Across all age groups, unintentional falls are the leading cause of nonfatal injuries in the United States and the second leading cause of accidental or unintentional injury deaths worldwide. It’s no surprise, as I was laying on the floor in the dark at the bottom of the stairs a few mornings ago, I thought about organising the home to prevent falls. Here are some organisational tips to make your home safer. The most common cause of falls is tripping over items on the floor. The Unclutterer site is full of resources to help you reduce the clutter in your home. It is especially important for high traffic areas to be clear of clutter as well as narrow hallways and staircases. Paint the edges with brightly coloured paint to denote changes in levels. Install handrails on steps and on sloped walkways and ensure they are secure. Keep walk areas clear of snow and ice. Hang tools for snow and ice removal neatly near the doorway so they are easily accessible when needed. Install motion sensor lighting at doorways and along walkways leading to doors. Repair uneven walking surfaces inside the home such as uneven floorboards or wrinkled carpets. Use only non-skid mats or use double-sided tape to secure rugs in place. Use a change colour to denote changes in flooring surface types or levels. Install handrails on all staircases and ensure they are secure. Keep a basket with a handle at the top and bottom of the stairs. If you have to carry more than one item up or down the stairs, put them into the basket. This way you can still hold the handrail with one hand and carry the basket with the other. Store the basket next to the stairs, not on the stairs. Mount liquid soap and shampoo dispensers on the bathtub wall. Place a small plastic stool with non-slip feet in bathtub to sit on if you’re tired, injured, or ill. Install sturdy grab bars in bathtubs and shower stalls and ensure they are secure and can hold your weight. Place non-slip matting in bathtubs and shower stalls. Place a lamp within easy reach of your bed. Also keep a flashlight by your bed in case the power is out and you need to get up. Put night-lights in the bathroom, hallways, bedroom, and kitchen. Install motion-sensitive lighting in dark areas such as basements, attics, and garages. Light switches should be installed at both ends of hallways and staircases. Reduce the need for extension cords by having an electrician install more electrical outlets. Secure electrical cords and telephone cables to baseboards. Place phone close to bed if you expect calls while you’re sleeping or if you may need to make emergency calls. Put glow-in-the-dark paint or stickers on light switches so you can see them in the dark. Rearrange furniture so it is easy to move around in the room. Ideally there should be at least a 30-inch (75cm) path for walking between pieces of furniture. Repair or remove wobbly or unstable furniture. Consider removing castor wheels from furniture (e.g. office chairs) or replace the furniture with the type that does not have wheels. Keep a chair or stool by the door so you can sit down to put on or remove boots and shoes. Move pet feeding dishes out of main traffic areas. Reorganise the kitchen so the most often-used items are more accessible and within easy reach. Keep a mop and broom handy by hanging it on the kitchen wall or in an easily accessible pantry so you can wipe up any spills immediately. Use ladders, not chairs or tables, to reach items on upper shelves. Remember to NEVER stand on chairs with wheels. A safety ladder can be folded and easily hung on the wall or slid into a closet so it is always handy. Get into the habit of doing a safety check on your ladder before you use it. Around the house, consider wearing footwear with non-slip soles. Ensure all your shoes fit you properly. Shoes that are too big or too small can cause you to slip or trip. During the winter months, be sure to wear boots with good traction. Keep a set of ice grippers in a basket at the front door so they will be easy to put on if the sidewalks are icy. As for me, I have started putting on my non-slip footwear and turning on the light before I walk down the stairs to make breakfast in the morning. This seemingly straightforward ditty holds a profound truth: three little words — reduce, reuse, recycle — are magic. There are endless ways you can apply them to your life — fun, creative ways that can cut clutter while benefitting your health, your budget, and your planet. Today, I want to apply them to an often-unrecognized source of clutter: cleaning products. An unofficial survey of my Facebook friends revealed that the average American home has somewhere between a bajillion and a gazillion cleaning products stashed in cupboards, under the sink, and in other prime storage areas. Not only do these products create physical clutter, they also create chemical clutter, which can pose significant risks to your health. The EPA reports that the air inside our homes can be five to ten times more toxic than the air outdoors, containing as many as 150 different pollutants, many of which come from petrochemical cleaners. Let’s turn to the three Rs to tackle this problem. Reduce — There are some easy ways to reduce the number of cleaning products you have to store and, more importantly, reduce the number of toxic chemicals in your home. Another great resource is GoodGuide, an online tool to help you find safe, healthy, green and ethical products or to find out how your favorite brands rank. Unfamiliar with how to use these three ingredients to clean? Reuse — Because you are mixing your own cleaning combinations, you can reuse spray bottles and buckets, cutting down on the amount of plastic heading to landfills. Mild solutions of water and vinegar or lemon juice left over after cleaning can be used to water acid-loving plants like azaleas and rhododendrons. Stronger solutions can be poured on weeds you would like to eliminate. Recycle — Turn old sheets, single socks, or stained towels and t-shirts into rags and use them instead of paper towels for cleaning. You can even tuck a dry or damp rag around one of those long handled floor dusters instead of using expensive disposable pads. Wash them and reuse them again the next time. Repurpose a plastic bag holder as a rag dispenser — pull them out through the opening in the bottom and, after they are washed, put them in the top. So your challenge for today: find one cleaning recipe to try and see if you can eliminate at least two ready-made cleaning products from your cabinets. Be sure to dispose of any toxic products safely (check your local government’s website for where to dispose of hazardous materials in your community). You go shopping, buy a bunch of things, and bring them home. Later on, you decide to return a number of items. That’s a great way to unclutter, right? Well, sometimes — and sort of. Certainly, you’ll want to return anything that’s defective. I bought some shoes online earlier this year and they looked exactly like what I wanted. But when they arrived, I found out they squeaked when I walked. Fortunately, I had bought them from a site that makes returns very easy. Bloomingdale’s has had enough. … So they’re attaching three-inch black-plastic tags to visible places on clothing, like the front bottom hemline. … The new devices on Bloomingdale’s clothing are unhidable; once removed, they cannot be reattached. No more wearing and returning, unless you decide to pretend “visible tags” are a new trend. I can talk about retail for clothing, two industries I worked retail in. For clothing, if the garment was still selling at full price, and showed no signs of wear, we would re-tag and sell it again at full price. If it were no longer selling at full price, we would re-tag and sell it at the current sale price. If it did show signs of wear but we were obliged by policy to accept it, we’d deeply discount it, donate it or just throw it in the trash. I can tell you from my experience in working at Restoration Hardware and at a few convenience stores/pharmacies: a good portion of stuff is thrown out. Everything that is possible to put back on the shelf is (unopened, like-new packages, unworn clothing, unused cushions and the like) and all products that can be returned to the manufacturer are. This is, at least at those stores, maybe 40% of returns. Everything else is logged and thrown away. We are trying to find more avenues to donate returned items, but most items that are returned are thought of as liabilities. … If you’ve tried on headphones, they were chucked. I mean, would you want to buy something that someone else had put in their ears? Another thing I just learned is that a number of retailers are using a program called The Retail Equation aimed at helping to eliminate return fraud and to control what the company calls returnaholics. Some of these returnaholics may have a problem with compulsive shopping and need help in fighting that condition. But most of us can be more thoughtful about our initial purchasing behaviors. If we don’t buy things we don’t need we won’t have to return those things we later don’t want, irrespective of the reason. Additionally, do we have valid reasons for the returns we do wish to make? Or, are we needlessly creating more work for the stores, and causing good merchandise to wind up in the trash? Would donating the item to a charity that needs that item be a better way of handling the unwanted merchandise? Whether the item is returnable at all. How long you have to make the return. If a receipt is required. Whether you’ll get cash or a store credit. If there’s a restocking fee. For many years, I’ve wanted to eat guacamole at home, but I’ve been unable to do so. Yes, I can buy avocados at the store. Yes, I own a fork and can mush up the avocado. Yes, I can either make or buy salsa to mix with the avocado. Yes, I have spices like cumin and crushed chili and even some lime juice to make the guacamole nearly perfect. But — and this is the but where everything falls apart — I do not own an extremely specialized serving device to put it in before eating it, like the Guacamole Bowl. Drats! 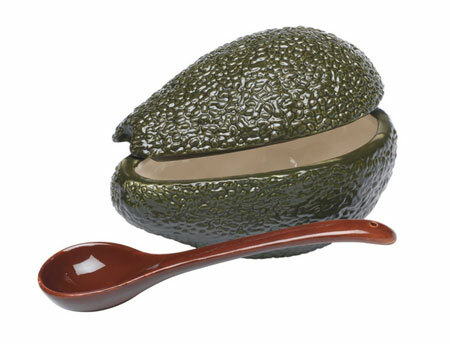 Without the Guacamole Bowl at home, I shall never know the delightful taste of the guacamole served from this ceramic avocado that holds a mere 1-1/2 cups of dip. Woe is me. Thanks to reader Erin for sharing this unitasker with us. P.S. Speaking of people named Erin … just wanted to let everyone know that last week editor-in-chief Erin Doland, her husband, and her son welcomed a beautiful baby girl into their family. The four are now at home, discovering their new routine, and feeling incredibly blessed. Chalkboard paint is magical. I bought a gallon for the kids last Christmas. You should have seen their little eyes light up when they unwrapped it. Today, they love it. We covered one wall in my son’s room and another outside his room. They draw pictures on it, leave notes, play games, and more. I mean, it’s permission to write on the wall. What kid wouldn’t love that? Label jars. Yes, a lot of people are using chalkboard paint for labels. And why not? It makes for a durable, re-usable identifier. I love these food canisters at Babble. Those are quite inexpensive and a bit of paint lets you easily find what you’re after. Identify spices. This one is just brilliant. It seems that, no matter how you store your spices, it’s never easy to find the jar you’re after. This clever person painted each lid with chalkboard paint and then wrote the name of each jar’s contents. I love it. Chore Chart. Maybe I’ll consider this for Camp Caolo 2014. The folks at Sweet Pickins have posted a full how-to for the great, door-length chore chart that they made and topped off with, you guessed it, chalkboard paint. DIY Clock. This is a nifty idea from Home Made Simple. A piece of plywood, a simple clock mechanism and some chalkboard paint make for an adorable addition to a child’s bedroom wall. Martha Stewart goes all out, of course, with this wall-sized, multi-tone calendar. It takes some effort (and a large wall) but the result is infinitely great looking and infinitely re-usable. No unitasker here! These chalkboard wine glasses are cute, too. No more drinking someone else’s merlot. Chalkboard “placemats” offer irresistible permission to write on the table for the little ones, as well as built-in place cards for larger family events. Finally, here’s a great tip. You’ll be tempted to write on your new surface as soon as it’s dry, but hold off. It’s possible for your initial scribbles to get “burned” into the paint. That is to say, leave a faint shadow of itself even after repeated erasing. To prevent that, HGTV explains, coat the fresh surface – all of it – with a thin layer of chalk. Erase that, and you’re good to go! I’m sure you’ve heard the adage “opposites attract.” In my experience with home organizing, I’ve found that opposites do attract more often than not. One person is usually a neatnik — thrilled by clear surfaces and closet organization. The other is a pack rat — inspired by the endless potential of stuff, glorious stuff! When these two extremes live together, sooner or later, conflicts arise. How can you make it work? Surprisingly, it has very little to do with the stuff itself and a lot to do with mindset. The first trick is to realize that neatniks and pack rats are two completely different species, so to make living together harmonious, you need to think about habitats. A bird and a fish may be able to live comfortably in the same house, but not in the same container. Put the bird in the bowl and she’ll drown. Put the fish in the cage and she’ll asphxiate. To make it work, both parties must agree on a standard for common areas and carve out a place where one can sing and the other can swim. Agree to the acceptable uses for shared areas. For example, you might agree that the living room is to be used for watching TV, reading, and playing games. Remove anything that is not associated with those activities from the shared area. In the example of the living room, this would mean no craft supplies, dishes, laundry, or egg incubators. Create specific homes for everything that belongs in the shared room — a bookcase for books, a drawer for videos, a cabinet for games. Labeling makes it easier for visual people to remember what goes where. Return each item to its home after each use. If it doesn’t have a home, it can’t stay. Anything not used for these purposes must stay away! Anyone breaking the rule can be fined. Use the money to hire a cleaner or go out to dinner. Set aside a few minutes each day to patrol the room. Use a hamper or basket to collect items that don’t belong. If something has a home elsewhere, put it back. If not, hold an “auction” to give household members a chance to bid on it. If they buy it, they have to find a home for it. Anything not bid on is going … going … gone! Same for anything that repeatedly ends up back in the basket. Take these items to a local charity and feel good about having fewer items to take care of. Find at least one place in the home for neatniks to live unfettered by clutter and one place for pack rats to stash their collections. Respect these separate spaces! No matter how successful you are at establishing shared and separate zones, you are still likely to run into differences of opinion about both. Before becoming combative over any stuff-related arguments, remember why you are together — love, money, you lost the key to the handcuffs, whatever. The point is, there is a reason you are living together. Remembering that reason may help you calm down when you are feeling frustrated. Try the practice of gratitude, in which you intentionally focus on the blessings in your life, no matter how small. This makes less room in your head and heart for the negative voices and can improve your patience and sense of well-being. When you are in a good place, you are less likely to say snarky things that will get the other person’s defenses up. Let me assure you, once the defenses are up, change is just not going to happen. Lastly, consider the fact that objects are like ink blots. Rarely do two people see the same thing and what they do see depends largely on past experiences and perspective. The overflow of crafting supplies looks like crazy-making chaos to one person, but is a beautiful harmony of endless potential to another. The clear counter-tops that make one partner hum with contentment remind the other of a sterile hospital stay when no one came to visit. So you must be patient with each other. Say what you see and ask the other person to do the same. Try to see the space through each other’s eyes, and, please, keep your sense of humor. If you need an outside perspective, ask a neutral third party or hire a home organizer or other professional to be your mediator. With large doses of patience and humor, you will be able to see the other’s sleek scales or resplendent plumage and recognize how truly glorious our differences make us. It is important to note that if the health and safety of household members is compromised by behavior at either end of the spectrum, the above strategies are not enough. Please consult a professional with licensed credentials in these extreme circumstances. For air travel: Do you want to have carry-on luggage only? Going carry-on only gets you out of the airport sooner, and it minimizes the risk of lost luggage. It also means you’re dragging more stuff through the airport and fighting for space in the overhead bins — and sometimes it’s simply not going to be practical. I make different trade-offs on different trips. You need to make this decision first when you’re flying. For other travel: What space constraints do you have? If you’re not going by air, you’ll still want to consider how well your luggage will fit in the car, bus, train, or other vehicles you’ll be using. How much space will you have for your things? How much technology do you want with you? Sometimes I’m going to need to do enough work that I’ve got to bring my laptop with me. On other vacations, I won’t take the laptop, but I will bring some smaller devices so I can do quick email checks, read e-books, etc. Other people prefer to go technology-free on a vacation. How will you handle washing clothes? I’m usually a daily hand-wash kind of traveller, which lets me pack a limited amount of clothes. I’ve got a friend who’s a Laundromat user, so she packs more than I do. If you prefer not to do laundry at all — and your trip is short enough to allow that — you’ll need to pack to accommodate this decision. How much wardrobe variety do you want? Sometimes we need a range of clothes to handle different types of events or different weather. But, sometimes how much we take is more a matter of this: How crazy will you go wearing the same few things every day? Will adding some accessories, which take less space than more clothes, give you enough wardrobe variety? What would be hard to get at your destination? Some things are easy to pick up if you need them for any reason, but others are more difficult. The answers to that questions will change depending on your destination, and they’ll also vary from person to person. Are you OK with using hotel shampoo, or do you really want your own brand, which may not be available at your destination? One thing I always pack is a spare pair of prescription eyeglasses — ever since I broke a pair on a trip and didn’t have a spare pair with me. Do you want to bring gifts? There are definitely times when I do want to pack some gifts: to give to people whose homes I’m staying in and/or to give to any special people I meet along the way. I do try to ensure that whatever gift I’m giving won’t create clutter for the person I’m giving the gift to; consumables often work well. Sometimes I can just purchase a gift like flowers or chocolate at my destination, but other times I really want to give something representative of home or something very special that I can’t just get on the run. What worked well in the past? I keep a personal packing checklist so I don’t forget what things I want to take, based on prior travels. I’ll never pack everything on that list, since it covers a range of locations and weather conditions, but taking a look at the list ensures I won’t forget something important. What do other people suggest? There are online packing lists that you might find useful: from Rick Steves, One Bag, Real Simple and more. These might give you ideas for your own list.